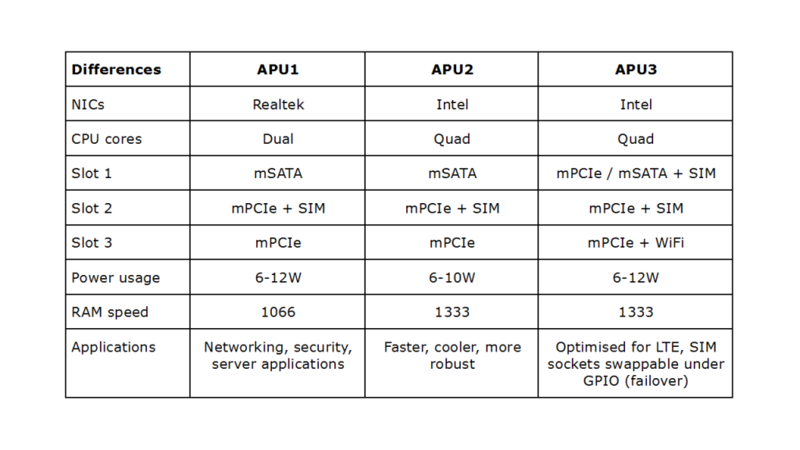 Home > News > What is the difference between the APU1, the APU2 and the APU3? So what is the difference between the APU1, the APU2 and the APU3 boards? It’s certainly something I’ve asked Paul more than once, so I figured I’m not the only one. So, does that make things a bit clearer for you? What is the difference between the APU boards? So what is the difference between an APU 1, an APU 2 and an APU 3? Hi, I’m Nikki from Yawarra Tiny Computers and that’s a question I’ve asked Paul more than one so I figured I wasn’t the only one. What are the APU boards? Firstly, what are these boards? So the APU 1, APU 2 and APU 3 are single board computers from PC Engines. They all have the same six inch square footprint, they have Gigabit Ethernet, four Gig of RAM and they’re all bootable from USB, SD card, mSATA drive or the SATA drive. So what about the differences? Well the APU 1 was the first board to be released and the APU 2 was released some time after that. So first let’s take a look at the difference between those two. And there are four main differences between the APU 1 and the APU 2. Firstly, the APU 1 has Realtek NICs while the APU 2 board has Intel NICs. Difference number 2, the APU 1 board has a dual-core CPU and the APU 2 has a quad-core CPU. Difference number three is that the APU 1 uses 1066 MHz RAM whereas the APU 2 uses 1333 MHz RAM. And difference number four is in the power usage. The APU 1 board uses anywhere from 6 to 12 watts depending on the CPU load whereas the APU 2 uses anywhere from 6 to 10 watts depend on the CPU load. So basically the APU 2 is an evolution of the APU 1. It’s faster, it’s cooler and it’s more robust. 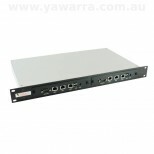 And that’s the one that we tend to recommend to people that they use unless they have a particular reason for using the APU 1. So what about the APU 2 to the APU 3. Well the APU 3 is a relatively new board and it’s a variation of the APU 2. And it’s optimized for 3G, 4G and LTE purposes and there are three main differences between the APU 2 and the APU 3 because of this. The first difference is that the APU 3 is able to take two SIM cards as opposed to the APU 2 which can only take one SIM card. In order to do this the expansion slots on the APU 3 are more flexible. Just keep in mind that if you want two SIM cards you can’t have an mSATA drive on the APU 3 board. The next difference on the APU 3 is that because there are two SIM cards they’ve been designed to be swappable under GPIO, which means you can use them for failover. And the final difference between the APU 2 and the APU 3 is that the power usage for the APU 3 board is slightly higher at 6 to 12 watts depending on CPU load. So those are the key differences between the APU 1, APU 2 and APU 3 boards. And check out this quick summary that I’ve put together for you of all the differences that I just outlined. So we currently offer the APU 1 and the APU 2 products and we’ll probably start offering the APU 3 once the board revision moves from B to C when they tend to be more stable. 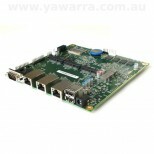 If you’re desperate to get your hands on an APU 3 board just get in touch with us. And if you want to learn more about the APU products in general I’ll put a link in the description of this video. And I will see you next time. Got any questions about the APU boards? Let us know in the comments below.